At Grindstone Canyon, you’ll find a community and features dedicated to helping you achieve success. Want to spend time enjoying the outdoors? Explore the neighboring woods, or hang out by the pool and hot tub. Need a ride to class? Take advantage of our resident shuttle to the University of Missouri campus. Stop by the leasing office today to learn about everything Grindstone Canyon offers! Each apartment features an upscale furniture package — including leather-style sofa and chair, coffee table, entertainment center, full-size mattresses, desk, and more — making your move a snap. Meet neighbors, relax, or hit the books at our clubhouse, featuring billiards, foosball, a kitchen, and more. Soak up the sun in our swimming pool with a hot tub and outdoor sundeck. Invite your friends, and enjoy our poolside charcoal grill. Grab some candy and popcorn and catch a movie in our upgraded theater room with comfortable reclining chairs and a HUGE viewing screen! We love pets at Grindstone Canyon. Bring your furry friends to your new home. We’re pet friendly! We can wrap all of your utilities into a single convenient bill with no overage charges! Don’t worry about paying for home entertainment separately — both internet and cable are conveniently included in your monthly rent. You even get free Wi-Fi inside your apartment! Every unit features a private, covered patio! Enjoy our complimentary coffee bar to get the energy you need to get through class. Available 24 hours for those late night study sessions. Our apartments are located right next to Columbia’s Grindstone Nature Area, and we’re just minutes from Columbia colleges, including the University of Missouri, Columbia College, Stephens College, and Moberly Area Community College. Our management team is dedicated to providing the best resident services. Our staff is on call all day and night to ensure that you have everything you need, whenever you need it. 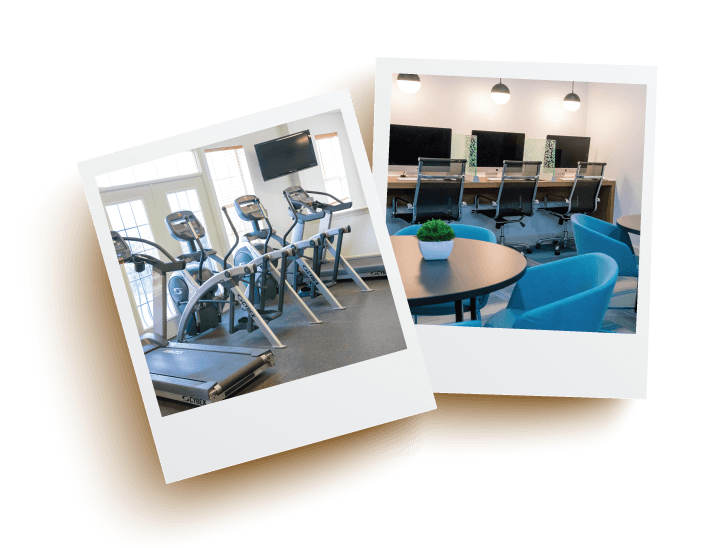 Our clubhouse amenities have controlled access to give you peace of mind. No need to worry about a place to keep your car. We’ve got you covered. Our individual, private parking garages guarantee you won’t have to search for a space. Help to save the environment with our resident recycling center serviced by The City of Columbia! Looking for a roommate? Our leasing staff will help you find the perfect person to share your apartment. Our 24-hour business center features iMacs, Wi-Fi, and free printing so you have everything you need to study successfully. Looking for a place to study? At Grindstone Canyon, you can study anytime and anywhere with our high-speed Wi-Fi throughout the community. When you need to get to class, take a ride on our private shuttle to the University of Missouri campus. Our shuttle also provides free rides to downtown on Thursday, Friday, and Saturday nights until 2:00 a.m.